Dr Murlidhar Devidas Amte (December 26, 1914 - February 9, 2008), popularly known as Baba Amte, was an Indian social worker and activist known for his work for poor people suffering from leprosy. 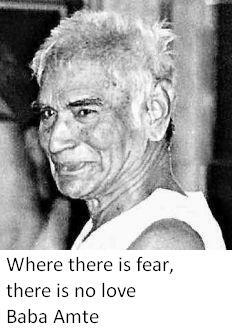 Here I have compiled down some of the famous Baba Amte quotes and sayings. Just hope you will like the quote compilation and learn something inspirational from Baba Amte words. Only a full stomach can afford to be principled. I don't want to be a great leader; I want to be a man who goes around with a little oil can and when he sees a breakdown, offers his help. To me, the man who does that is greater than any holy man in saffron-colored robes. The mechanic with the oilcan: that is my ideal in life. Enough ants can destroy a python. I am leaving to live along the Narmada. Narmada will linger on the lips of the nation as a symbol of all struggles against social injustice. One can live without fingers, but not self-respect. A captain never deserts a sinking ship. To save a sinking country, brave sailors must emerge! You never see a dead lion in his cave; you never see an old bird die in her nest. Then why should I? Hearth is where the heart is. When you give roses to others, the perfume is bound to linger on your hands! I sought my soul, but I could not see my soul; I sought my god, but my god eluded me; And then I sought my sisters and my brothers, and in them I found all three. The air is not thin yet, so keep climbing.